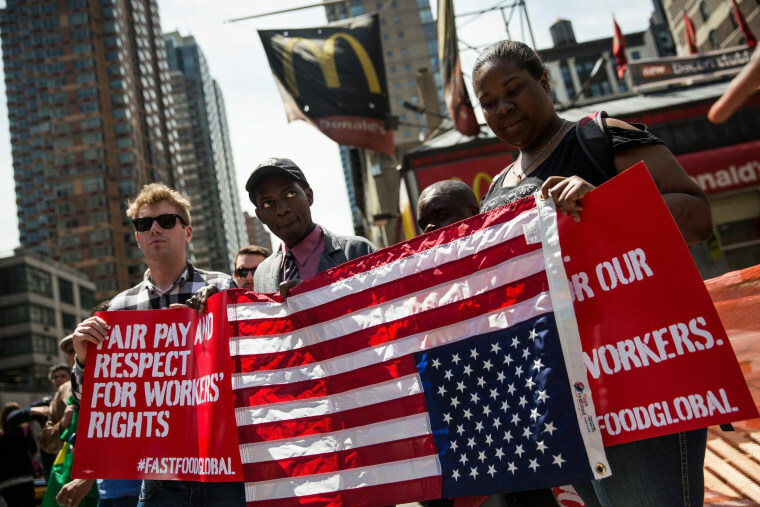 Fast-food workers plan strikes in 150 cities across the United States and protests in 33 other countries on May 15 to demand higher pay and better working conditions, organizers said in New York on Wednesday. It is the latest in a series of protests over the past 18 months in the United States that have targeted fast-food chains including McDonald's Corp., Burger King Worldwide Inc., Wendy's Co. and Yum Brands Inc.'s KFC chain. In December, workers held rallies in hundreds of U.S. cities, saying their take-home pay was not enough to live on. U.S. fast-food workers taking part will walk off their jobs on May 15 to demand $15 an hour in wages and the right to form a union without retaliation, organizers said. Cities where strikes are planned include Philadelphia; Sacramento, California; and Miami and Orlando in Florida. Organizers say that protests around the world will include cities in Europe, Asia, South America and Asia, among others. Advocacy groups involved in planning the strikes include Fast Food Forward and Hungry for Justice, supported by the International Union of Food, Agricultural, Hotel, Restaurant, Catering, Tobacco and Allied Workers' Association, which represents about 12 million workers in 126 countries. Both McDonald's, the world's biggest restaurant chain by revenue, which has drawn the ire of many of the prospective strikers, and Burger King defended their treatment of employees in separate statements. The planned strikes come at a time when Democrats have been mounting efforts to raise the federal minimum wage ahead of this year's midterm congressional elections, seeing income inequality as a powerful campaign issue. President Barack Obama has pushed Congress to raise the federal minimum wage to $10.10 per hour, up from the current $7.25, a move the Republican-controlled House of Representatives has resisted.